TO Barnet, where Conservative MP Mike Freer will be mindful of the threat from Kentish Town lawyer Sarah Sackman, the Labour challenger in Finchley and Golders Green at next May’s general election. 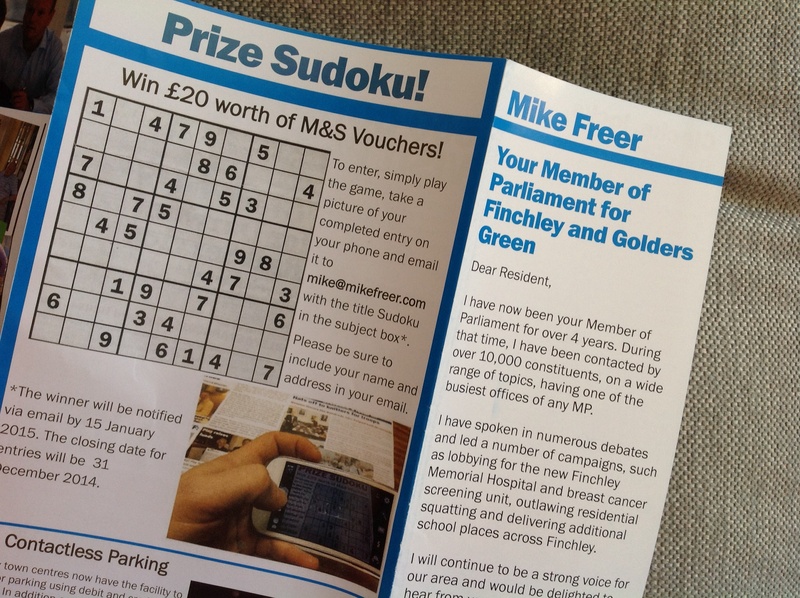 His latest update leaflet has been doing the rounds this week, devoting most of its back page to a Sudoku puzzle, just in case you’re tired of reading about policies and achievements and things. Finish the grid and you could win £20 quid to spend in Marks and Spencer. Of course, then, Mike will have your address, phone number and email address. The potential to create a useful database of people who read letterbox leaflets ahead of next year’s contest would be a delicious exchange for the small spend on the vouchers, a terrible cynic might think.